Your eClass calendar can be found under “Site pages” in the Navigation block on your eClass homepage. The calendar can also be accessed as a block in the right-hand column. 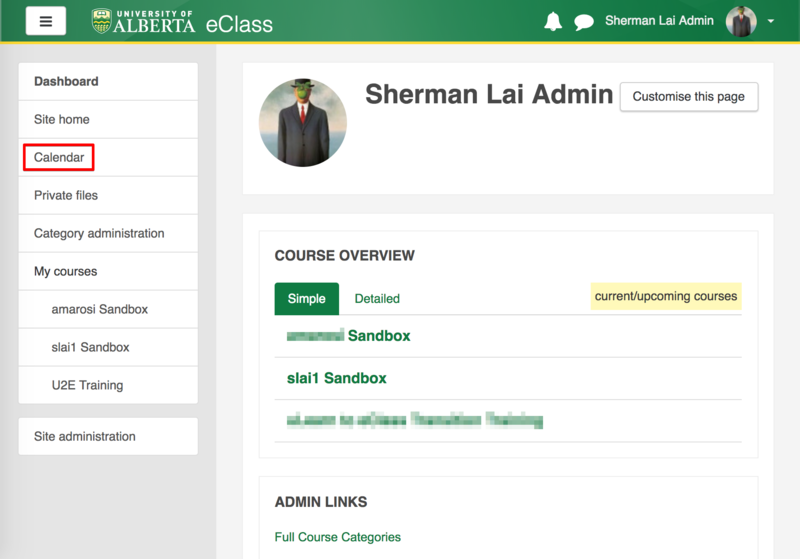 You can add it to your eClass Course Overview page and many instructors add it directly into their course pages. Click the “Export calendar” button. Select the time period you desire and whether or not to include non-course related events. 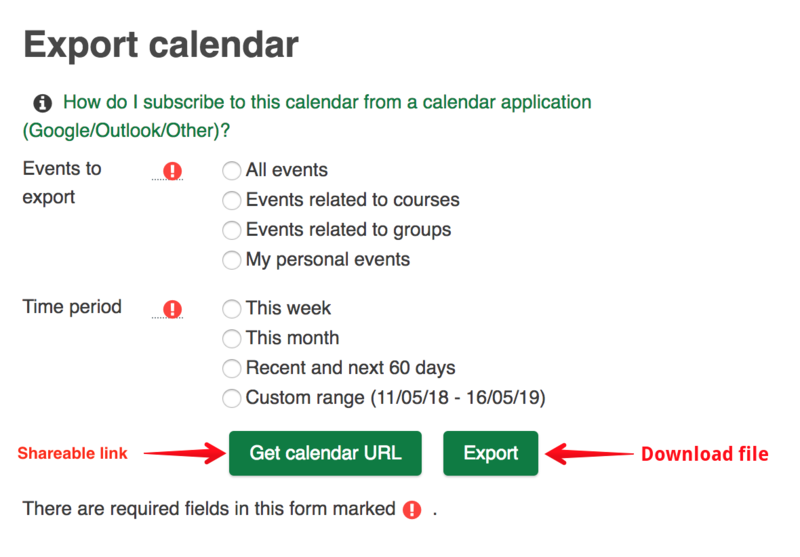 Click “Export” to download your calendar or select “Get calendar URL” to get a URL that you can share with others so that they can download your eClass calendar. Unfortunately, exporting the calendar for a single course is not a feature that is currently available in eClass. In some applications such as Microsoft Outlook, the exported calendar can be filtered by category to see individual classes but a more reliable method to view a single course's calendar is on its eClass page (see issues with eClass calendar export below). Although the calendar inside of eClass provides detailed month views for individual courses, exporting the calendar while viewing a single course’s calendar will still export your entire calendar for all courses. The calendar export feature in eClass is known to have caused issues especially when used to export assignment due dates. Because assignment due dates have only one date and time associated with them - unlike meetings which have 2 (a start and end time) - most programs (such as Google Calendar, Outlook, and iCal) automatically convert the due date into an hour long event starting at the given time. This means that for assignment due dates falling between 11pm and 11:59pm, the exported event appears on both the date the assignment is due and the day following. Even if the due date does not fall within this time range, confusion can arise due to the hour long event starting at the time that the assignment is due. Due to this unreliability with the calendar export feature, we recommend that students also reference the calendar inside of eClass or their course syllabus for confirmation of due dates.